Ransomware applications these days are incredibly obnoxious in a way that they do not even try to hide its presence. 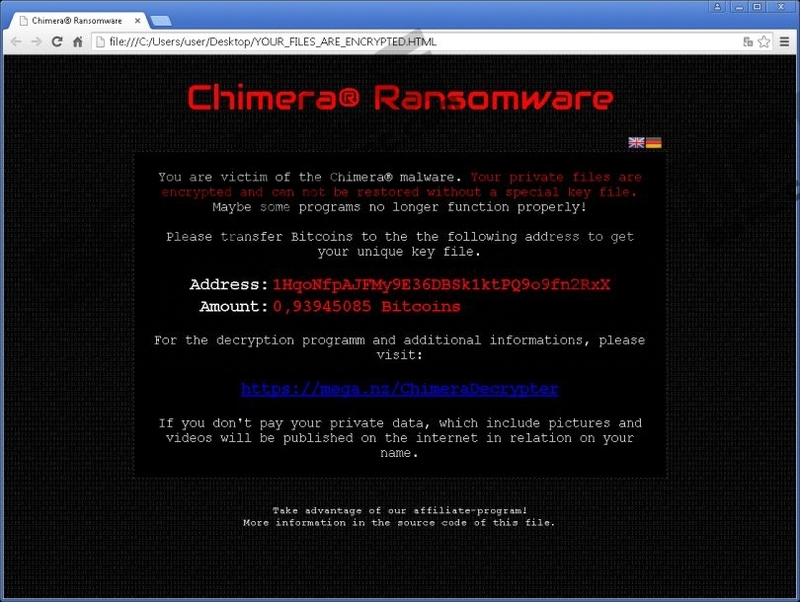 Chimera Ransomware is not like the Ukash Virus ransomware programs that used to maintain that they are the representatives of the local law enforcement authorities. Chimera Ransomware simply comes over to your computer and literally encrypts all of your files, plastering a notification on your screen. The most frustrating thing is that you cannot remove Chimera Ransomware because the program deletes itself automatically once the payload is dropped on your PC. Thus, you need to deal with the consequences of this infection, ensuring that similar programs do not enter your system again. When you get infected with this program, you see a German message on your screen. The message says that your files have been encrypted, and now you have to pay a decryption fee via the Tor network. The fee amounts for around 0,94 Bitcoin, which is approximately $218. Only when you pay the fee, you will be able to access mega.nz/ChimeraDecrypter and download the decryption tool. At least this is what the infection wants you to think. However, we cannot guarantee that the Chimera Decrypter actually works. For all its worth, you might be throwing your money away for nothing. Although the program seems to “speak” German, it does not mean that users in other countries cannot be infected by it. Chimera Ransomware can also be categorized as a Trojan, and this means that the application gets installed on target computers stealthily. Users do not notice when or how this program manages to slither into their computers. It could be that you download the installation file accidentally when you click some unfamiliar link or a pop-up that jumps into your screen on a third-party website. The point is that you have to maintain your system’s security by staying away from suspicious pages. What about your files? Unfortunately, a computer security application cannot help you decrypt your files. You can always restore your files from a backup drive, and this is exactly why computer security experts always point out how important it is to have one. What’s more, you may also want to try and use a professional decryption tool. If you need any recommendations, you can always leave us a comment below, and our customer support team will try its best to assist you. As far as Chimera Ransomware is concerned, since the program removes itself, you no longer need to worry about the main infections files. However, you need to get rid of the notification on your screen. Not to mention that there might be more unwanted applications that jump the bandwagon and arrive together with the ransomware program. Follow the instructions below to get yourself a licensed antispyware tool and scan your PC through and through. Some users may be unwilling to invest in a computer security application because they think that the dangers of the Internet are hyperbolized, but that is definitely not the case. With a computer security application of your choice, you will be able to avoid Chimera Ransomware and other similar programs. Safeguard your system against potential exploitation and financial fraud. Type http://www.pchtreat.com/download-sph into the address bar. Press Enter and click Run on the download dialog box. Install SpyHunter and scan your computer. Quick & tested solution for Chimera Ransomware removal. My Computer got encrypted! After Payment i got my Data back.